IN 1968, EUGENE IONESCO RELEASED "a personal memoir" entitled Present Past Past Present. It was a collection of memories presented in short passages that flowed easily from childhood to adulthood. 1967 sat beside 1940. His earliest memories were paired with memories of his daughter as a toddler. 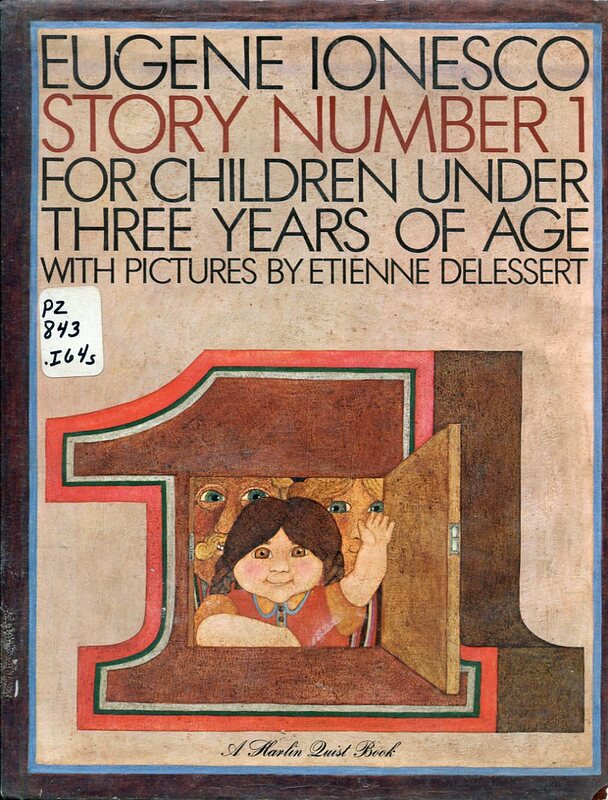 And sandwiched between these often dark and brooding reminiscences were four light stories "for children less than three years old" simply numbered Story Number 1, Story Number 2, Story Number 3, and Story Number 4. At the time the memoir appeared, Ionesco was one of the towers of theater. 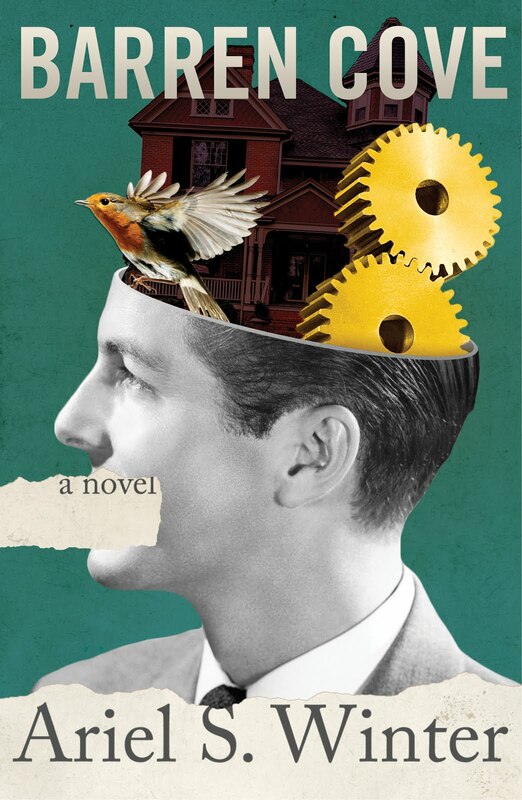 His biting satires eschewed straight narrative--in fact, they often seemed to be a sequence of non sequiturs--and concerned themselves with the philosophical questions of the relationships between the individual and the state, the individual and reality, and the individual and death. His most famous play Rhinoceros premiered in 1959. It is the story of a small town in which all of the inhabitants but one turn into rhinoceroses, Ionesco's symbol for a person with blind faith in the state. Two years later, the critic Martin Esslin included Ionesco in a group of playwrights--along with Samuel Beckett, Jean Genet, and Arthur Adamov--who practiced what he called the Theater of the Absurd, plays that address Albert Camus's discussion in The Myth of Sisyphus that man's search for meaning and order in life is futile. 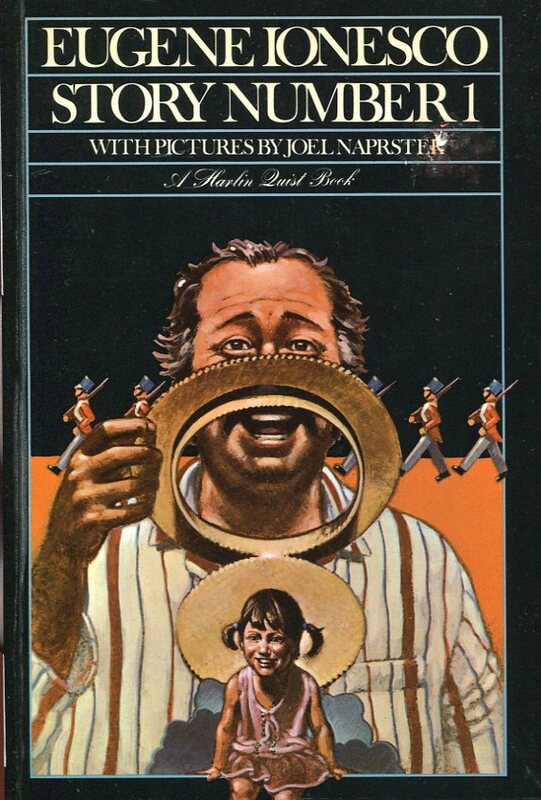 For a writer usually engaged in such heady topics, Ionesco's children's stories, jammed as they were in his memoir, seem somewhat out of place. Which is perhaps why they were immediately excised from the memoir and released in the form of picture books. Story Number 1 was published by Harlin Quist in the same year as Present Past Past Present. "JOSETTE IS THIRTY-THREE MONTHS OLD, and she is already a big girl." Every morning she creeps to her parents room to wake them, and on this particular morning, Josette's parents are hungover in bed after a night of nightclubs and restaurants. This is of course lost on Josette, but not on the maid Jacqueline, who in annoyance at her employers' laziness pushes her way into the room with an overladen breakfast tray. 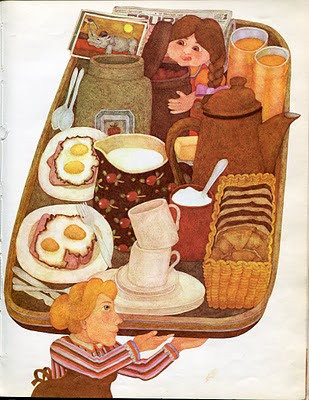 Father orders Josette and Jacquline away, and the two retire to the kitchen where they devour Papa and Mama's food. This doesn't put Josette off for long. She returns to the bedroom where she demands a story from Papa. "And while mama sleeps (because she is exhausted from having celebrated too much), papa tells Josette a story." There was once a little girl named Jacqueline. She had a papa named Jacqueline and a mama named Jacqueline, and sisters, cousins, aunts, uncles, friends, toys, in short, everyone in her life was named Jacqueline too. Papa's story does not progress much beyond that. And soon the real Jacqueline puts an end to it as utter nonsense. 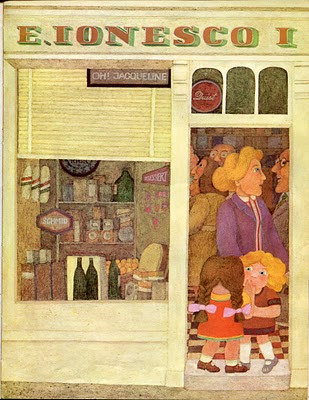 Instead Jacqueline takes Josette with her to do the day's shopping. Once again the real Jacqueline steps in to assert reality. She addresses all of the customers who look at Josette "with big, frightened eyes." "'It's nothing,' the maid says calmly. 'Don't be upset. These are just the silly stories her papa tells her.'" 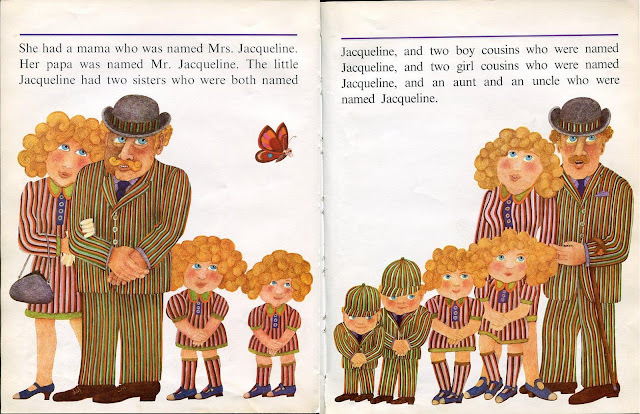 ALL FOUR OF IONESCO'S CHILDREN'S STORIES are often said to have been written for his daughter Marie-France. If that is the case, they were likely written in 1946 or '47 as Marie-France was born in 1944. Why Ionesco would let twenty years pass before publishing the stories, or in that case, why he would chose at that late date to publish the stories at all is unclear. I suspect it is more likely that they were written for a granddaughter, but I have been unable to find if Ionesco had a granddaughter. If anyone has more definitive information, please share. 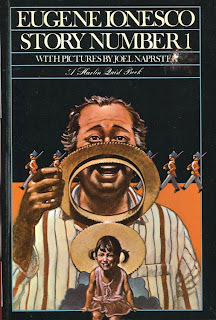 IN A 1971 ADVERTISEMENT for the first two of Ionesco's children books, a prominent blurb reads, "Ionesco's poker-faced absurdities and Delessert's uncanny illustrations reflect the interior world of childhood with immense originality. 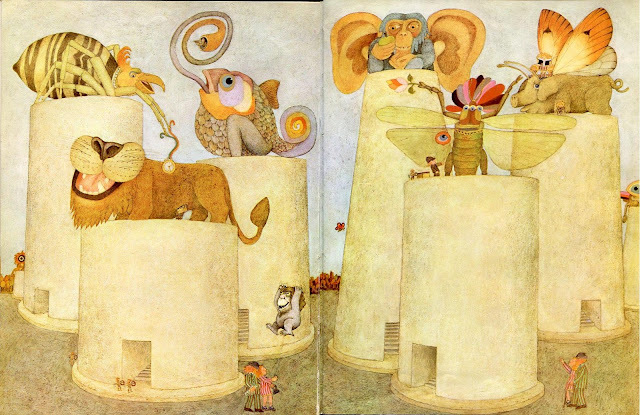 Their Story Number 1 and Story Number 2 must be considered among the most imaginative picture books of the last decade." The source of that blurb? Maurice Sendak. I'm sure he was not at all swayed by one of Delessert's surreal illustrations in which there is a cameo of a certain wild thing. 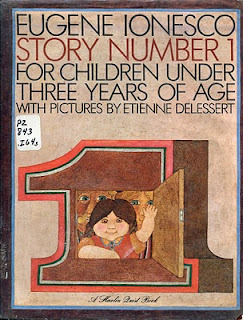 IN 1978, Harlin Quist published a second edition of Story Number 1 illustrated by Joel Naprstek. To see all of Naprstek's illustrations, visit my Flickr set here. Coming Soon: Eugène Ionesco's Story Number 2. 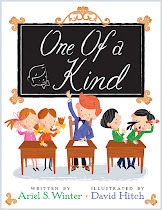 Story number 1 is the antidote to my astonishment at meeting another child called Alan. In adulthood I am dismayed that I share my name with so many . . .
Are these the entire stories that you've put up? or just parts of it?